Similarly, if you want to root out a Hindu family from its ancestral home in Bangladesh, just accuse one of its members of insulting the Islamic Prophet Muhammad. You will soon find thousands of Muslims rushing to burn the Hindu family’s whole neighborhood down, without hesitation or evidence. Such behavior towards minorities -- Christians in Pakistan and Hindus in Bangladesh -- has become commonplace among fundamentalist Muslims in both countries, whose governments have surrendered to Islamists. On November 5, for instance, a Bangladeshi Muslim, Alomgir Hossein, filed a complaint against a Hindu, Titu Roy, for allegedly posting derogatory remarks about the Islamic Prophet Muhammed on Facebook. The Muslims of Titu Roy's hometown of Thakurpara (a Hindu-dominated village in Rangpur) gave police a 24-hour ultimatum to arrest the "blasphemer," or they would take action. Although Titu Roy lives with his wife and two children 500 miles away in Narayanganj, a few days later, after Friday prayers, around 20,000 Muslims from neighboring villages descended upon Thakurpara to take "revenge." 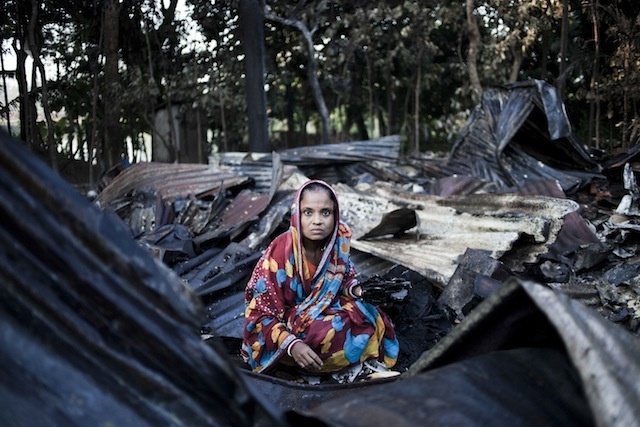 Ignoring police attempts at dissuasion, the mob set fire to at least 30 Hindu homes, and looted and vandalized others.